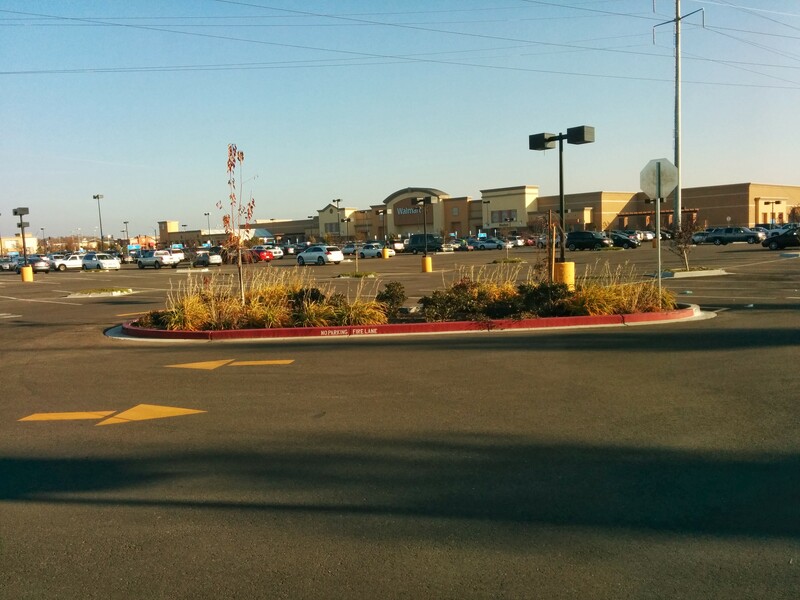 You are here: Home » Why are Stockton’s parking lots so big and empty? This is the standard response from city planners or big box retailers when asked to explain why there is so much empty parking at newer shopping centers. While these parking lots sit empty nearly the entire year, apologists will invoke the holiday rush between Thanksgiving and Christmas as the driving force behind unnecessary asphalt moats. 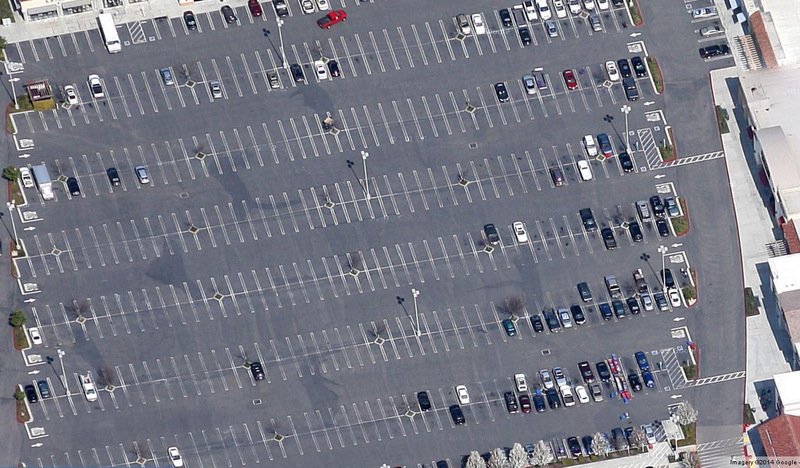 Sure, no one enjoys searching for parking when going on an eleventh-hour present run, but are all of these parking spots really used during peak shopping times? During my recent trip home, I took a drive over to Stockton’s newer commercial areas to see whether or not these extra acres are justified. What I found should make all Stocktonians question the city’s parking policies. Take a look. This is the Wal-Mart parking lot on Dec. 22nd at 3:00pm. This is the Wal-Mart parking lot in Park West Place on Sunday, December 22nd around 3:00pm. Inside, the store was packed with shoppers looking for last-minute gifts. But even with this rush, the parking lot was filled to just two thirds capacity. But Wal-Mart is only one store, perhaps parking lots serving multiple retailers tell a different story. With this in mind, I crossed the street to the parking lots of Target, Lowe’s, the Sports Authority, PetSmart and dozens of other retailers and found a similar story. As you can see, even though these stores were very busy, the parking lots remained half filled. And during the other 11 months of the year, these lots are usually less than a quarter filled. These underused lots are representative of Stockton’s legacy of inefficiency. While citizens were sold on projects like Park West Place because of the sales tax revenue and jobs, city officials never considered how to best utilize space, and as a result prime farmland was developed in an inefficient manner. Why would we allow stores to plow over farm land for parking spots that no one will ever use? Sadly, Stockton has this kind of inefficiency written into its own laws. As part of the city’s zoning ordinance, large shopping centers such as Park West Place are required to build 1 parking space per 250 square feet of retail space. And that’s the minimum. If you take the roughly 750,000 square feet at Park West Place, that comes out to 3,000 total parking spaces. This is not a phenomenon unique to Stockton as most cities impose similarly ridiculous parking standards. Urban Planner Charles Marohn over at the blog Strong Towns makes a compelling argument for why cities should update their codes to reflect real parking demand. For years, cities have required stores to build unnecessary amounts of parking. As a result, smaller stores can’t compete, since they don’t have the money to buy up enough land to comply with these outdated requirements. Marohn notes that big box stores use these rules to their advantage. 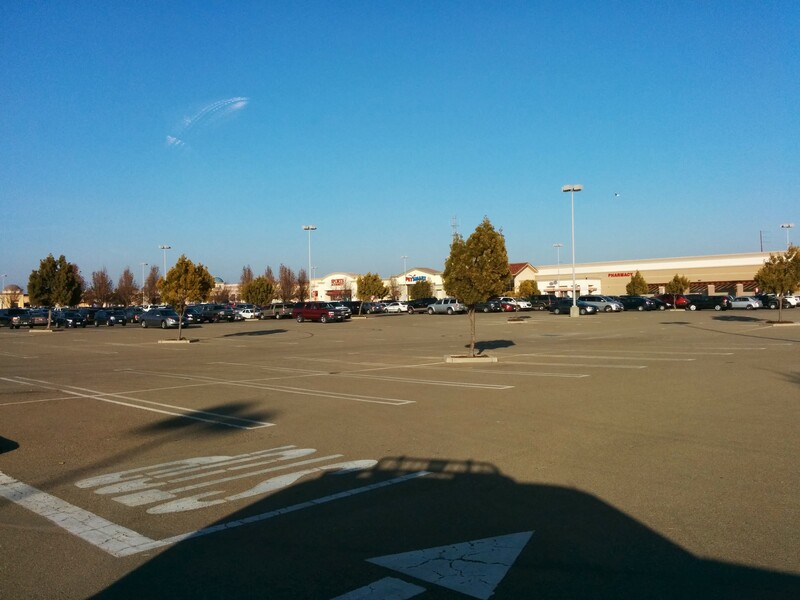 Stockton wastes valuable farm land for parking lots that sit empty most of the time. Whether or not Stockton should tackle this problem is a no-brainer; all the city has to do is abolish parking minimums (or at least lower them) and retailers won’t build excess parking, and we can save space for more productive uses. For the existing oversupply of parking, Stockton has an opportunity for infill. Take a look at Weberstown Mall, which has seen two restaurants—Chipotle and On the Border Grill (which is now Grand Buffet)—built on former parking spaces and still has room to handle the holiday rush. Luckily, Stockton appears to be wising up to the follies of poor planning. Planning Commissioner Steve Chase frequently discusses the need for Stockton to grow inward. A new sprawling subdivision was voted down by the City Planning Commission just a few weeks ago. Hopefully, city officials now have the will to do away with antiquated planning norms such as parking minimums. It’s an easy step. In some places, such as at Trinity Parkway, a number of those excess spaces were at one point to be utilized as a Park & Ride location, as a condition of development (and granted some may be used that way now in an unofficial capacity). While that isn’t a sound rationale for building sprawling parking lots, it can at the least help direct some of those spaces towards an unmet need. Interesting. How did the developer get out of including a Park & Ride lot at Trinity Parkway? While I wasn’t directly involved, my understanding is that communication was one of the challenges. Without a direct line to someone at all phases, it likely slipped between the cracks when transitioning from initial planning and development to build-out. There are a handful of existing PnRs that have been successfully built this way throughout the county and hopefully that continues with any future big box or housing developments. Great book (though quite lengthy). The seminal text on the problems of parking. Also, there needs to be a higher landscape/greenbelt to asphalt ratio; the presence of the latter needs to increase more demonstratively. Why is it landscaping and greenbelts are minimized in these gargantuan parking lots to literal nonexistence and relegated as the lowest priority, one little tree for every 100 parking spaces? Green humanizes, trees make the experience more pleasant, creates shade and cools these vast asphalt deserts in the summer. I also loath these regional shopping centers’ rudimentary layouts, a massive linear wall of shops and stores on one side with cargo shipping in the back and an infinite vast parking lot adjacent the facades. Whatever happened to design integration with it aesthetic versatility? Surely you jest…… or you are working with the occupy Wallyville groups?. Walmart’s lots are currently empty (and with online shopping they will become more so). Those empty parking lots will be much safer for the homeless than living on the river. The asphalt is warmer, no mud, the cops are always at WalMart so it is much safer (especially for the kids). The encampment will be self-policed, and the bakery, produce and such that is now thrown away, will be “recycled” into someones dinner. Walmart has always welcomed RV’s into their lots for overnights. This symbiotic relationship provides protection for the Walmart store as well as the customers. The homeless don’t eat as much as the rest of us…. but they are Walmart customers when they do get a buck or two. Cities are supposed to provide services, such as buses, to the people. Even Stockton can come into compliance without any added cost. The biggest problem to date is to determine who, WallMart or the City, will supply the showers and restrooms. The “rough plumbing” is already there, Walmart always insists on that in case of further expansion. At present Stockton would say they can’t afford it….. but Walmart sure could.